Firstrade, one of the popular discount online brokers, is offering incentives to people who join and participate in their newly launched online community, The Investor Network. 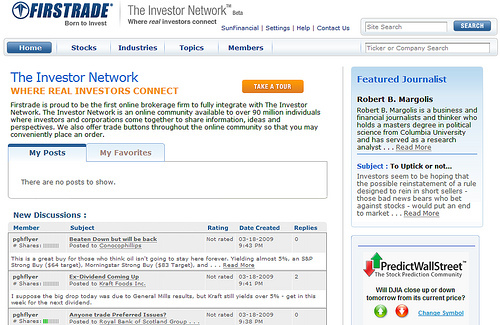 Firstrade is very pleased to announce the launch of a promotion on The Investor Network. We’ll be giving an Apple iPod Nano to the three members that contribute the largest number of quality posts by April 16, 2009. Additionally, if you are one of the first 150 members who contribute three posts by April 16, 2009 you will win a $10 Amazon.com Gift Card! You do, however, have to have Firstrade as your broker in order to join their community. Open an Firstrade account if you are interested in becoming a community member. Setting up an online community seem to be a popular trend these days. Many brokers, including Scottrade, TradeKing and Zecco, already have theirs. Even third parties have jumped on the bandwagon with their own networks. It’s touted as a place where real investors (community members usually have to have an account with a broker) share their real investing stories (you can choose to share your investment portfolio). I have joined a couple of them, but never really participated because of time constraints. Are you a member of any community? Have you picked up any investing idea from the discussion? Online Interest Checking Plus Savings Accounts: Who Offers the Best Deal?